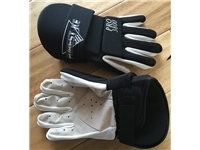 Professional level match play broom gloves. Cow hide suede leather palm for excellent grip and control. 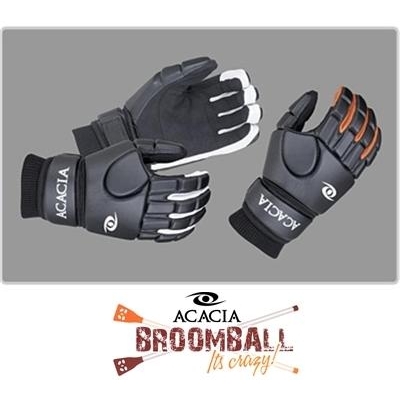 Napa leather padded foam back and wrist for maximum protection. Wrist strap for easy fit and grip. 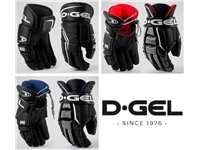 Glove sizing is comparable to men's glove sizes. Black/Orange gloves are $5 extra. Made in Pakistan. Measure around your dominant hand above your thumb and around the back of your hand. Click here to print a paper ruler. 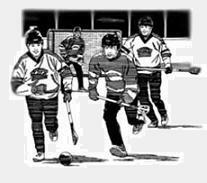 Adult X-Small . . . . 6.5"
Adult Small . . . . 7.5"
Adult Medium . . . . 8.5"
Adult Large . . . . 9.5"
Adult XL . . . . 10.5"
By way of background, ice hockey gloves provide the most protection but the padding can unduly restrict wrist movement, thereby limiting the maximum ball handling required for broomball. These gloves are a nice compromise as they are nowhere near as bulky as hockey gloves. 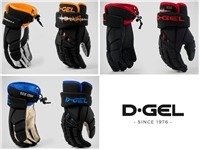 Protection is adequate, and the cuff is about the right size for protection without compromising wrist mobility. 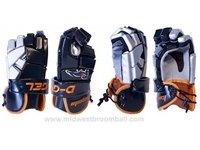 The omission of lacrosse style lacing is a bonus, as the lacing and underlying padding tend dig into the nerve inside of my arm at the bottom of my wrist. The softness of the material also permits to be in the washer and clean it in a gentle cycle without unduly damaging the glove. It's not the perfect glove, but reasonably meets all my needs. These gloves are great; good padding, protective palms so your hands don't sting like crazy if you block a shot. But, the major downfall of these gloves is that they are very bulky. The outside of your hand is covered in at least an inch of padding. But, I suspect that it will wear down over time.